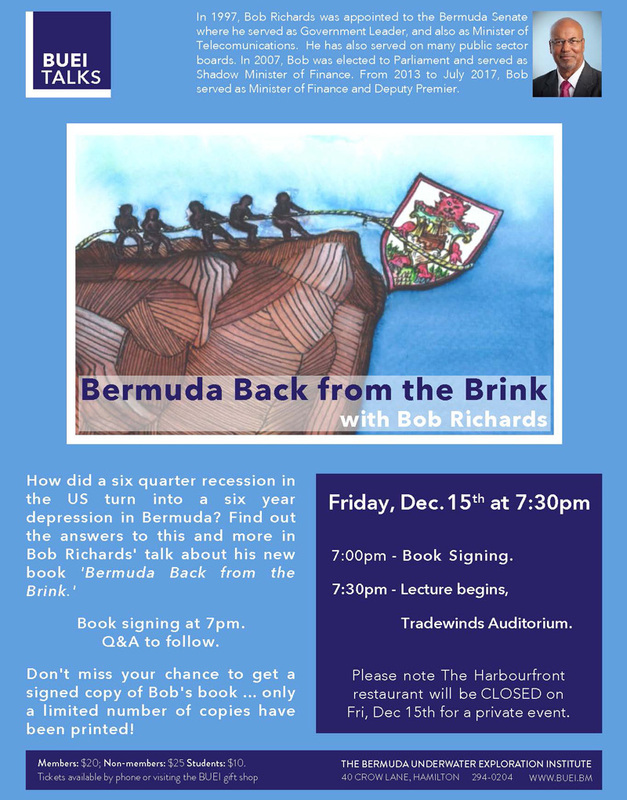 Former Deputy Premier and Finance Minister Bob Richards is getting set to release his new book, called “Bermuda Back from the Brink”, with the Bermuda Underwater Exploration Institute [BUEI] getting set to host a lecture and book signing with Mr Richards this Friday. That may be an interesting read. I note that only yesterday the Government referred to our $2.5 billion in debt but today the Auditor-General is referring to our $3.7 billion debt. Can Bob explain what appears to be a significant disparity in the amount of our debt? Underfunded pensions that no one wants to talk about. Hope he has in there how he gave our Airport away for 30 years. Ya, and your beloved PLP had plans for an airport that was estimated to cost twice as much as this one. Too bad we couldn’t afford it because your beloved PLP put us into so much debt. I hope he does tell the story about the airport, the whole story from the beginning! Personally I’m glad the airport went the way it did because it keeps sticky fingers out of the cookie jar. Better 30 than the 100 year ‘give away’ and the $600M the PLP were going to spend. But, again, OJ is too stupid to understand that. We owe a huge debt of gratitude to Bob Richards. He gave his blood, sweat and tears to this island and I, for one, say thank you Bob for beginning the process for what will surely be a long and difficult journey for our island and our children. We went from virtually a debt free nation 20 years ago to a $2-3 billion debtor nation with a daily $500,000 interest charge that will undoubtedly increase with the fed rate increasing. Its time to pay the piper. Very true. The time is indeed looming when the piper must be paid. Too bad so many cannot or will not recognize how important controlling spending plays a major role in the solution. Meanwhile, the last few months have not reflected an attitude that encourages inward investment- the other major factor. Bob was able to manage our finances and write a book at the same time? I guess there is hope that our current Minister Of Finance can multitask while on all of these trips (with his entourage whose expenses we don’t know). Thank you for all your efforts Bob. Between yourself, John Swan and the late great Larry Burchall you have tried to enlighten and improve the situation of all who live here. I’m sorry that you have been given such a torrid time for your honesty while trying to help us all out of the mire. I hope that you now get to enjoy some peace. 2. Love Thy Govt contracts and hold them close. 4. When you become irrelevant and loathed, tell people how brilliant you are. Onion Juse for goodness sake grow up. Banks do NOT lend money for a person to buy a house, building or an airport – without giving you a MORTGAGE if you do NOT HAVE THE CASH TO BUILD OR BUY IT YOURSELF. It is akin to a 30 year mortgage. I have one on my house as does thousands and thousands of us. The word is ‘Mortgage’. Look it up. Better yet, go to HSBC or BNTB and talk to them about the concept of borrowing money when you do not have any yourself. Bob Richards – you are owed a HUGE debt of gratitude that can never be paid or quantified. You did great. That simple. Do not let anyone tell you otherwise. THOUSANDS of us thank you, Grant Gibbons, and the OBA for being there to stop the good ship Bermuda from sinking. Blowing his own horn. How great was I says Bob!! !